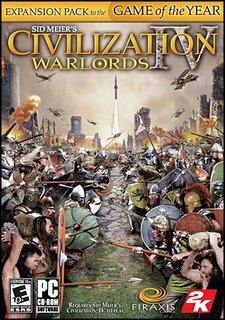 long-time readers will remember that i've long been addicted to the civilization video game franchise, including the current civ game, civilization IV. i've been hooked ever since i played the original civilization at a friend's house back in high school, and civ IV is so good that i made the mistake of showing it to my girlfriend, which immediately got her hooked, too. the expansion pack adds cool new features—i've been waiting for the "vassal state" option since hearing about it months ago—along with some really interesting new scenarios. i've been playing the "vikings" scenario a lot so far, and last night virago & i tried out the "gengis khan" scenario, finding it to be pretty cool as well. Hey thanks for telling me about this. I had Jerame go out and get it for me, but I haven't had a chance to play it yet. Did you see the Civ Rome game too? Sim City meets Civilization? civcity: rome sounds like it could be pretty cool... way more complex than sim city. maybe when it comes down in price, i'll give it a shot, but i don't need to buy another video game right now. the reviews on amazon aren't very good, though.